FORT LEE, New Jersey, Sept. 10, 2018 /PRNewswire/ -- Siklu, the global market leader in mmWave wireless solutions, is announcing a new Terminal Unit for its industry-leading PtMP MultiHaul™ series: the MultiHaul™ compact TU (cTU) T201. The self-aligning mmWave radio is ideal for low profile installations anywhere. The cTU condenses MultiHaul™ rich feature set already deployed in Service Provider and Smart Cities networks, into the smallest mmWave radio in the industry, 6.5x 3.1x 1 in, roughly the size of an iPhone X. Service providers will benefit from using the cTU for 5G Fixed Wireless Access applications on the same mmWave wireless network simultaneously, delivering multi-gigabit connectivity, with an even more unobtrusive cTU. The MultiHaul™ cTU is also supported by Siklu's SmartHaul™ WiNDE application, a SaaS application for automated network design with PTP and PTMP Siklu radios. "The cTU provides exceptional value with competitively priced capacity, simple installation and powerful management tools to achieve lower ROIs," said Eyal Assa, Siklu's CEO. 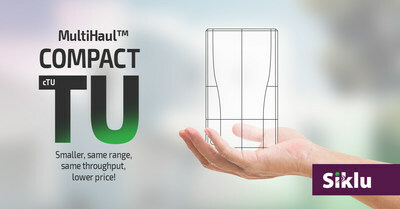 "Extending the offering of our PtMP MultiHaul™ series to provide the same reliable performance in a tiny form factor and a lower price, continues Siklu's leadership and innovation in the market. General availability is expected during Q4 2018." Siklu's cTU solution will be showcased at MWC Americas 2018, Los Angeles, September 12-14, booth #W.1246.